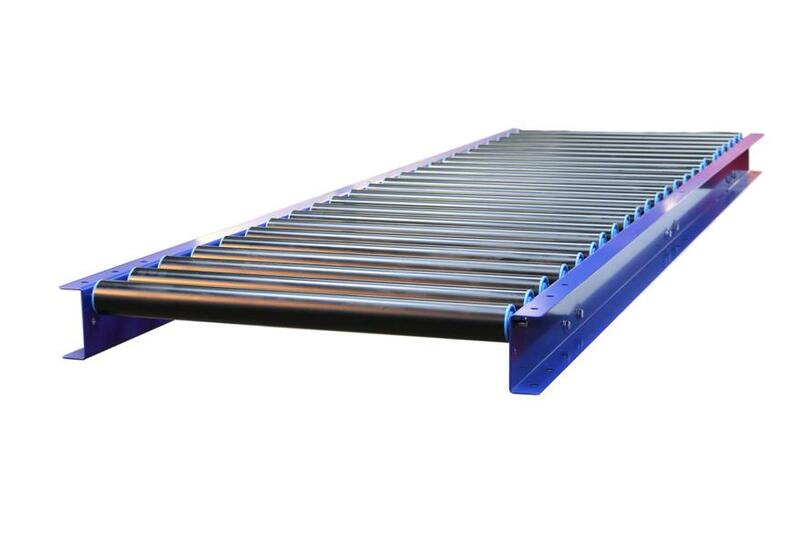 The KCT 3 plastic roller conveyor is manufactured using mild steel conveyor frames. In addition to plastic roller conveyor offered within the KCT 3 range, a heavier duty gravity roller conveyor is available with steel conveyor rollers. The popular KCT 3 roller conveyor is a medium duty roller track, meeting the high standards of all KBR Machinery's manufactured gravity roller conveyors. The KCT 3 plastic roller conveyor has been proven in a wide range of applications, choosen for its robust, solid and reliable build quality. The KCT 3 roller conveyor frame can be supplied in one of 3 standard colours, RAL5002 Ultramarine Blue, RAL 9010 Pure White, RAL 9005 Jet Black . In addition to the standard colour range, custom powder coated colours are available. The range includes stainless 304 conveyor frames manufactured for use within clean and sterile conveyor applications. KCT 3 roller conveyors incorporate spring loaded steel conveyor rollers, thus speeding up conveyor maintenance and cleaning of equipment. KCT 3 high impact plastic conveyor roller offers similar load capacities of steel conveyor rollers therefore remaining a durable, robust and cost effective working roller conveyor. Supplied with high impact non-marking PVC conveyor rollers in addition to hard wearing plastic conveyor bearings with steel ball race. Two load ratings are available (25 KGS, 80 KGS), as a result the conveyor roller bearings and steel conveyor rollers in particular, provide excellent durability and wear within challenging working environments. A stainless steel spindle can be supplied, along with sealed bearings incorporating stainless steel ball races. This provides excellent protection against the ingress of water and chemical resistance. KCT 3 plastic roller conveyors offer a low point of inertia and quick rotation speed. Medium duty plastic rollers together with optional bearing types, roller centres and spindles, subsequently means KCT 3 plastic roller tracks are the perfect medium duty roller conveyor system. Ideal for medium roller conveyor systems, track saws, out doors, long spans and/or end of line accumulation. Where medium duty rollers and conveyors are required. Minimum product size 180mm and above. Bearings: Plastic housing with steel ball bearings. Tube: 2.8mm High Impact Extruded PVC. PLEASE NOTE: Product weight should not exceed the weight capacity for the conveyor rollers. Furthermore 50mm diameter plastic roller conveyors have a weight capacity of 25 - 80 kgs per roller at 300mm width. As a rule with every additional 100mm increment, the load capacity will decrease by 10%.